Stock index forecasting is vital for making informed investment decisions. 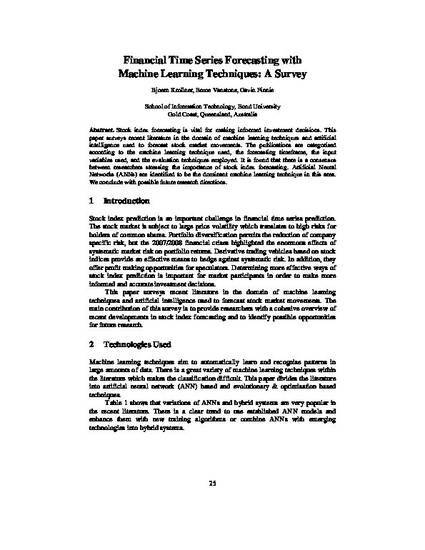 This paper surveys recent literature in the domain of machine learning techniques and artificial intelligence used to forecast stock market movements. The publications are categorised according to the machine learning technique used, the forecasting timeframe, the input variables used, and the evaluation techniques employed. It is found that there is a consensus between researchers stressing the importance of stock index forecasting. Artificial Neural Networks (ANNs) are identified to be the dominant machine learning technique in this area. We conclude with possible future research directions. Krollner, B., Vanstone, B. and Finnie, G. (2010). Financial time series forecasting with machine learning techniques: A survey. Paper presented at the European Symposium on Artificial Neural Networks: Computational and Machine Learning, Bruges, Belgium. © Copyright Bjoern Krollner, Bruce Vanstone & Gavin Finnie, 2010.